The Thomson MO 6 was the successor of the Thomson MO 5. This machine was widely used in French schools. 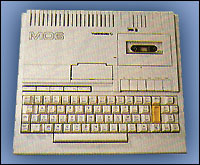 It was compatible with the MO 5 and the other members of its family (TO 7, TO 8, TO 9 and TO 9 plus). It has two versions of BASIC on ROM, one to be compatible with MO5 and BASIC 128 (both made by Microsoft). Almost all memory (101 KB) was accessible with BASIC thanks to a transparent 16 KB bank switching mechanism. An optional 3.5" floppy disk drive (640 KB) was available. It had a short life because soon after it was launched, the TO 8 came and challenged to it. see more Thomson MO 6 Ebay auctions !